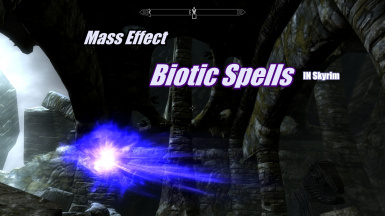 Use unique spells based on the biotic powers in Mass Effect trilogy. Fight your enemies with your Biotic Charge, throw, warp, singularity, and many more. First of all sorry for my english, my english teatcher was the games i played so you will find many gramatic errors. 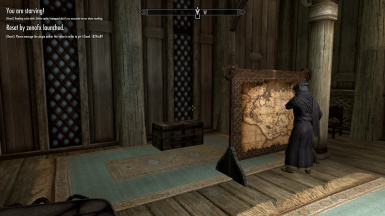 Also this is just the start of the mod, if you like the spells and want to see more of them, please endorse and give feedback, this will make the mod progress. Biotic Charge: Rushes into a target and knock them of they feet using an powerful biotic barrier arround you. Deal 100 extra damage if the targets are affected by singularity, warp or stasis. for now this is an shout and requires Wuld word. Singularity: Create a dark energy sphere at the target, lifting any one who pass near it. 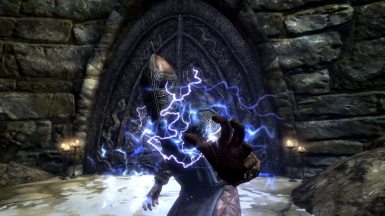 Shock Wave: The spell sends an series of biotic impacts in front of the user ignoring some obstacles, dealing great damage and knocking enemies in the way. Biotic palm: Concentrate biotic energy in your palm and strike an enemy with it. Stasis: temporarily immobilize an enemy and lower his resistance for 6 seconds, also allow biotic combos. Lift: cause enemies to float helplessly in the air, making them more vulnerable to attack and Biotic Combos. Barrier: Reinforce armor with this biotic field. 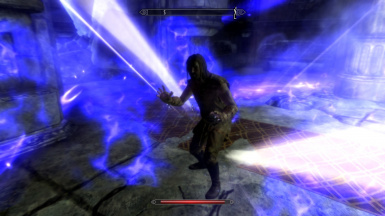 Barrier also allow the use of Nova without loosing all magicka. You can also detonate the barrier to lift enemies near you. Like mass effect, you can improve your weapon with warp, unlike mass effect, you can improve your weapons with other Biotic spells as well. This was requested by Degalon. 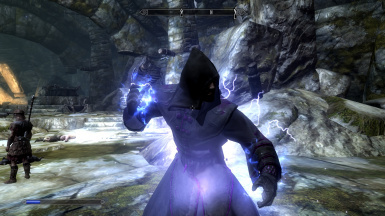 Those enchantments are unlike any other, as they must be casted as an lesser power, and lasts almost forever or until the weapon is sheathed. 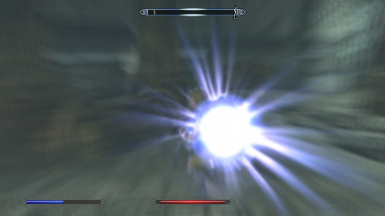 Warp Weapon: Enhance your weapon by adding Warp effect. cost 100 and last until the weapon is sheathed. Lesser power. Lift Weapon: Your weapon has a chance of lifting enemies. Stasis Weapon: Your weapon has a chance of put the foe in Stasis. For now They need to be cast in the correct order, for example warp first + throw second work, but throw first + warp second does not. Singularity: Some times, the foe will float like if where in space, other times the foe will go to the ground, go back and go to the ground normally. Slam: it does not always work, as it is terrain dependent. Also the foe is smashed in the ground 2 times. 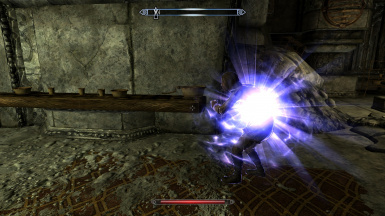 Lift: lift makes the foe invulnerable for unknown reasons, if the player try to lift an object like an chair or alchemy table, the object will be electrified indefinably. 0.1: started the mod, added warp, throw and biotic charge. 0.2: Small changes in warp, throw, and Biotic charge. Added Singularity and Warp weapon. Added Biotic Combos. 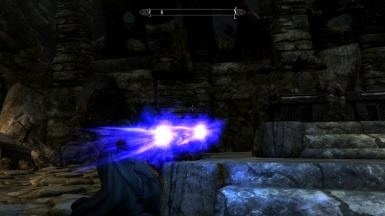 0.5:Added Slam weapon, lift weapon, throw weapon, stasis weapon, shockwave weapon, improved Biotic charge visuals(now you is invisible when charging, just like mass effect) Improved shockwave visuals(Now there are shock in the waves) Redone Singularity, Improved Barrier(now can be detonated for lifting effect). 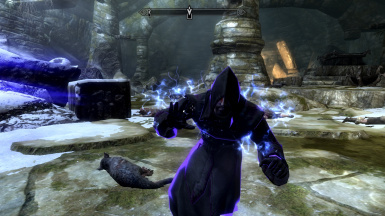 EnaiSiaion, the author of Apocalypse Spell Package, As he let me use his Slam Script and Toggle Script. Special thanks to every one that suggested, commented, and endorsed the mod.